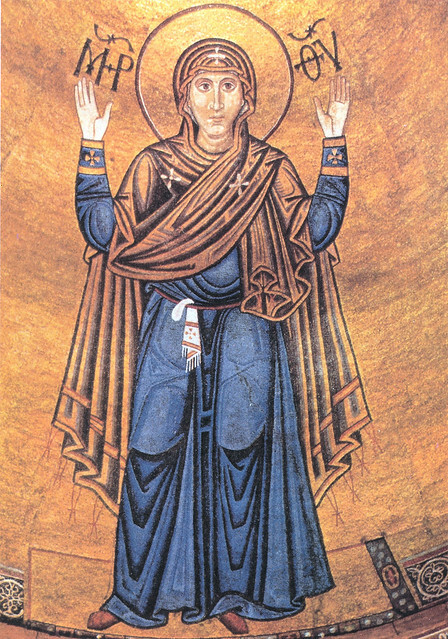 The Presentation of the Theotokos into the Temple, also called The Entrance, is one of the Great Feasts of the Byzantine Rite, celebrated today. According to the legends Our Lady was taken — or presented—by her parents, SS. Joachim and Anne, to the Jewish Temple in Jerusalem as a young girl. One of the earliest sources of this tradition is the non- canonical* Protoevangelion of James, also called the Infancy Gospel of James, composed in Syria around 150 AD. In the story, Mary was solemnly received by the temple community which was headed by the priest Zacharias, the father of John the Baptist. She was led inside, accompanied by virgins, to live inside the Holy of Holies, to prepare her to become the living sanctuary of God when she would conceive the Divine Child. She was fed by the angels, until the age of twelve when she was betrothed to Joseph, who was an old man (and thus no threat to her perpetual virginity). This Proto-evangelion was one of several “Infancy Gospels” which were created about the unknown lives of Jesus and Mary. They are filled with miraculous and often stunning events, while giving many popular images which have endured to our day (Joseph as an old widower, Jesus being born in a cave, the hiding of John the Baptist and his mother during the Massacre of the Innocents). These “gospels” were meant to be pious stories which would convey the specialness of Jesus and His Mother, and answer the demands of the popular and pious imagination for “more” than what was in the Gospels. They were written with little knowledge of Judaism and its practices, and often incorporate pagan practices known to the Christian population, such as temple virgins. And in a sense, they are written by people who are saying, “This is how God should have done it!” to make the lives of Mary and Jesus filled with high drama and spectacular events. So why commemorate liturgically something which we know , through biblical archaeology and Jewish studies, to have never taken place? *Non-canonical means a book that was not accepted into the Bible because it was not inspired by the Holy Spirit. O Virgin Mother of God, you are the one foretold by the prophets. You are the glory of the apostles and the pride of martyrs and the cause of renewal for the human race. Through you we have been reconciled with God. (Vespers, at Psalm 140). Desiring to reveal His salvation to the Gentiles, the Lord has now chosen from among mortals her that knew not wedlock. She is to be a sign of reconciliation and renewal (Matins, Ode 5). Blessing of Children today: Greek Catholic priests in Slovakia give children a special blessing at the church on this feast day. The prayer used is from the Book of Numbers, chapter 6, vv 24-26, the blessing which God tells Aaron and his successor priests to use on the children. Thus, this is one of the most ancient rituals done from Judaism, and it finds a comfortable home in our Byzantine Catholic Church which is filled with Scripture and rites which are often rooted in Judaism. At the ambon prayer, the priest reads this blessing, and blesses the children with holy water. Withdrawing from the world may not seem to be an option for t he ordinary Christian. But even the busiest person in the noisiest city can do this – and probably should do it just for the sake of sanity in our world in which we are constantly connected to other people, and via the internet, to all events taking place around the planet. In the story, Mary withdraws into the Holy of Holies, the innermost, most sacred place, where God came down from heaven and touched the earth on Mount Zion. There she was to spend years pondering Him, and being fed by Him through an angel who brought her bread (Panis Angelicus, the Bread of Angels, foreshadowing the Holy Eucharist). Jesus did the same thing throughout His life, right until the end, going away from the crowds in order to pray. This is something that every one of us should try to do – turn everything off, sit in silence, open ourselves to the Holy Spirit, and let God come to us, quietly and gently. Here, we can listen to voice of God in that silence, and we can absorb what He says to us. His Word comes to us – Christ our God. The best place to do this is in a church, before the Most Blessed Sacrament, where Jesus sits and waits for us to come to Him. If we can’t get to a church, then find a spot in which to withdraw from everything else, and be dependent upon God for a little while. A parent may have to do this in a bathroom behind a locked door, or a college student in a corner of the library, but do it we must. For if we do not sit (or stand) and listen to Word of God in God’s Voice, we are living only part of the Christian life. Have mercy on us, O Lord, and dear Mother of God, please pray for us. « It’s beginning to look a lot like … well, 40 days from now it will for sure!